It has also warned BAE Systems it could lose future contracts under Labour unless its boss took a £7m pay cut. Firms who pay their bosses more than 20 times the wage of their lowest paid workers would not get government contracts if Labour wins power. The Conservatives described Labour's plans as "a total shambles". Shadow chancellor John McDonnell said Labour's plans to increase taxes on City transactions would be a "Robin Hood tax" that would "make the financial sector pay its fair share" after the damage caused by the financial crisis. He rejected claims it would damage the City, saying the tax was "not about punishing bankers or anything like that" but "tackling a couple of loopholes" in the system. "We bailed out the City 10 years ago when the crash came, we poured hundreds of billions of pounds into it. Since then £100bn has been given out in bonuses in the City. So we are asking for a small contribution...to fund our public services." Labour said it would extend the existing 0.5% stamp duty paid on shares to other financial assets, including investments known as derivatives. It would also end an exemption, known as intermediaries relief, that applies to some banks and hedge funds, saying that together the measures would bring in between £4.7bn and £5.6bn a year. Labour also wants a tax avoidance crackdown and would require anyone earning more than £1m a year to publish their tax returns. Mr McDonnell has also been defending Labour's executive pay cap proposals, which he said would include the chief executive of one of the world's largest defence contractors, Charles Woodburn, who is paid £7.5m a year. BAE Systems is building two new aircraft carriers and four submarines to carry the replacement for Britain's Trident nuclear weapons system, as well as being a major supplier to the US defence department. But Mr McDonnell suggested future contracts with the UK government could be at risk if Mr Woodburn did not take a pay cut, if Labour wins power on 8 June. Asked by the BBC's John Pienaar how long the company would get to comply with the policy, he said: "It would depend on the agreement that we have with that company and with their shareholders and with the workforce." He added: "We want to get to equitable pay. We want to address the grotesque inequalities that there are within our society, that actually do undermine in many ways the standing of those particular companies." 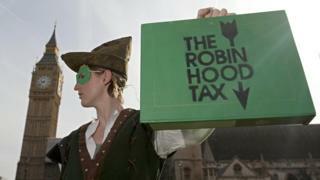 A Robin Hood tax isn't a new idea, far from it. John McDonnell has long campaigned for it. The other name for it is a financial transactions tax, where a small levy is placed on certain financial transactions or trades. Here in the UK, we already pay stamp duty when shares are bought and traded. Last year that raised just over £3bn. Labour wants to go further and extend the levy to bonds and more complex financial instruments called derivatives, which it claims would raise £26bn over the course of the next Parliament, and help curb speculative computer-driven high frequency trading. Labour says the plan mirrors a similar one being planned by the EU, but Europe's scheme is currently in the long grass. The UK ruled out taking part, fearing it would hurt the City of London, where huge amounts of these trades are done. If Labour's plans came to fruition, critics say these transactions would simply move elsewhere or the costs would be passed on to the likes of pensions funds, ultimately hitting consumers. That's on top of worries over the potential loss of business and jobs in the City because of Brexit. Mr McDonnell also said Labour would ensure "fairness" in the UK's tax system with a string of tax-avoidance measures. These include increasing the number of people investigating the tax affairs of the wealthiest individuals, banning companies involved in tax avoidance from public contracts, sanctions against "abusive" tax havens, and forcing MPs to publish details of any offshore financial interests. Labour's financial transaction tax plans were attacked by the Institute of Economic Affairs, which described them as "another example of the fallacy that corporations can be tapped for cash with no wider costs". "In reality, it's always ordinary people who ultimately pay, including consumers and workers," said the free market think tank's chief economist, Julian Jessop. Robin Hood or Mickey Mouse? Lib Dem former Business Secretary Vince Cable said Labour's economy policy was "less Robin Hood than Mickey Mouse". Jane Ellison, the Conservative financial secretary to the Treasury, said Labour London mayor Sadiq Khan had described a financial transaction tax as "madness". She said the plan "risks economic growth and jobs". Ms Ellison added that the government had recovered an extra £140bn in tax since 2010 that would have been lost to evasion or avoidance. Under the Tories' housing proposals, the government would offer English councils and housing associations funding to enable them to build more homes and make it easier for them to acquire land for development. Some of these homes would have to be social rented accommodation with a fixed term - after which they would be sold, with the tenant getting first refusal. The Conservatives said this would allow increases in land and property values to be reinvested in social housing.